The North Atlantic Treaty Organization (NATO); French: Organisation du Traité de l'Atlantique Nord (OTAN); (also called the North Atlantic Alliance, the Atlantic Alliance, or the Western Alliance) is a military alliance established by the signing of the North Atlantic Treaty on 4 April 1949. Headquartered in Brussels, Belgium, the organization constitutes a system of collective defense in which its member states agree to mutual defense in response to an attack by any external party. For its first few years, NATO was not much more than a political association. However the Korean War galvanized the member states, and an integrated military structure was built up under the direction of two U.S. supreme commanders. The first NATO Secretary General Lord Ismay, famously described the organization's goal was "to keep the Russians out, the Americans in, and the Germans down". Throughout the Cold War doubts over the strength of the relationship between the European states and the United States ebbed and flowed, along with doubts over the credibility of the NATO defense against a prospective Soviet invasion—doubts that led to the development of the independent French nuclear deterrent and the withdrawal of the French from NATO's military structure from 1966. After the fall of the Berlin Wall in 1989, the organization became drawn into the Balkans while building better links with former potential enemies to the east, which culminated with the former Warsaw Pact states joining the alliance. Since the September 11, 2001 terrorist attacks, NATO has attempted to refocus itself to new challenges and has deployed troops to Afghanistan and trainers to Iraq. The Treaty of Brussels, signed on March 17, 1948 by Belgium, the Netherlands, Luxembourg, France and the United Kingdom is considered the precursor to the NATO agreement. The treaty and the Soviet Berlin Blockade led to the creation of the Western European Union's Defense Organization in September 1948. However, participation of the United States was thought necessary in order to counter the military power of the USSR, and therefore talks for a new military alliance began almost immediately. These talks resulted in the North Atlantic Treaty, which was signed in Washington, D.C. on April 4, 1949. It included the five Treaty of Brussels states, as well as the United States, Canada, Portugal, Italy, Norway, Denmark and Iceland. Support for the Treaty was not unanimous; Iceland suffered an anti-NATO riot in March 1949 which may have been Communist-inspired. Three years later, on 18 February 1952, Greece and Turkey also joined. The Parties of NATO agreed that an armed attack against one or more of them in Europe or North America shall be considered an attack against them all. Consequently they agree that, if such an armed attack occurs, each of them, in exercise of the right of individual or collective self-defense will assist the Party or Parties being attacked, individually and in concert with the other Parties, such action as it deems necessary, including the use of armed force, to restore and maintain the security of the North Atlantic area. Such action as it deems necessary, including the use of armed force does not necessarily mean that other member states will respond with military action against the aggressor(s). Rather they are obliged to respond, but maintain the freedom to choose how they will respond. This differs from Article IV of the Treaty of Brussels (which founded the Western European Union) which clearly states that the response must include military action. It is however often assumed that NATO members will aid the attacked member militarily. Further, the article limits the organization's scope to Europe and North America, which explains why the invasion of the British Falkland Islands did not result in NATO involvement. The outbreak of the Korean War in 1950 was crucial for NATO as it raised the apparent threat level greatly (all Communist countries were suspected of working together) and forced the alliance to develop concrete military plans. The 1952 Lisbon conference, seeking to provide the forces necessary for NATO's Long-Term Defense Plan, called for an expansion to 96 divisions. However this requirement was dropped the following year to roughly 35 divisions with heavier use to be made of nuclear weapons. At this time, NATO could call on about 15 ready divisions in Central Europe, and another ten in Italy and Scandinavia. Also at Lisbon, the post of Secretary General of NATO as the organization's chief civilian was also created, and Baron Hastings Ismay eventually appointed to the post. Later, in September 1952, the first major NATO maritime exercises began; Operation Mainbrace brought together 200 ships and over 50,000 personnel to practice the defense of Denmark and Norway. Meanwhile, while this overt military preparation was going on, covert stay-behind arrangements to continue resistance after a successful Soviet invasion ('Operation Gladio'), initially made by the Western European Union, were being transferred to NATO control. Ultimately unofficial bonds began to grow between NATO's armed forces, such as the NATO Tiger Association and competitions such as the Canadian Army Trophy for tank gunnery. The incorporation of West Germany into the organization on May 9, 1955 was described as "a decisive turning point in the history of our continent" by Halvard Lange, Foreign Minister of Norway at the time. A major reason for Germany's entry into the alliance was that without German manpower, it would have been impossible to field enough conventional forces to to resist a Soviet invasion. Indeed, one of its immediate results was the creation of the Warsaw Pact, signed on May 14, 1955 by the Soviet Union, Hungary, Czechoslovakia, Poland, Bulgaria, Romania, Albania, and East Germany, as a formal response to this event, thereby delineating the two opposing sides of the Cold War. The unity of NATO was breached early on in its history, with a crisis occurring during Charles de Gaulle's presidency of France from 1958 onward. De Gaulle protested the United States' strong role in the organization and what he perceived as a special relationship between the United States and the United Kingdom. In a memorandum sent to President Dwight D. Eisenhower and Prime Minister Harold Macmillan on September 17, 1958, he argued for the creation of a tripartite directorate that would put France on an equal footing with the United States and the United Kingdom, and also for the expansion of NATO's coverage to include geographical areas of interest to France, most notably Algeria, where France was waging a counter-insurgency and sought NATO assistance. Considering the response given to be unsatisfactory, and in order to give France, in the event of a East German incursion into West Germany, the option of coming to a separate peace with the Eastern bloc instead of being drawn into a NATO-Warsaw Pact global war, de Gaulle began to build an independent defence for his country. On 11 March 1959, France withdrew its Mediterranean fleet from NATO command; three months later, in June 1959, de Gaulle banned the stationing of foreign nuclear weapons on French soil. This caused the United States to transfer two hundred military aircraft out of France and return control of the ten major air force bases that had operated in France since 1950 to the French by 1967. In the meantime, France had initiated an independent nuclear deterrence programme, spearheaded by the "Force de frappe" ("Striking force"). France tested its first nuclear weapon, Gerboise Bleue, on February 13, 1960, in (what was then) French Algeria. Though France showed solidarity with the rest of NATO during the Cuban missile crisis in 1962, de Gaulle continued his pursuit of an independent defence by removing France's Atlantic and Channel fleets from NATO command. In 1966, all French armed forces were removed from NATO's integrated military command, and all non-French NATO troops were asked to leave France. This withdrawal forced the relocation of the Supreme Headquarters Allied Powers Europe (SHAPE) from Paris to Casteau, north of Mons, Belgium, by October 16, 1967. France remained a member of the alliance, and committed to the defense of Europe from possible Communist attack with its own forces stationed in the Federal Republic of Germany throughout this period. France rejoined NATO's Military Committee in 1995, and has since intensified working relations with the military structure. France has not, however, rejoined the integrated military command and no non-French NATO troops are allowed to be based on its soil. The policies of current French President Nicolas Sarkozy appear to be aimed at eventual re-integration. The creation of NATO brought about some standardization of allied military terminology, procedures, and technology, which in many cases meant European countries adopting U.S. practices. The roughly 1,300 Standardization Agreements (STANAGs) codifies the standardization that NATO has achieved. Hence, the 7.62_51 NATO rifle cartridge was introduced in the 1950s as a standard firearm cartridge among many NATO countries. Fabrique Nationale's FAL became the most popular 7.62 NATO rifle in Europe and served into the early 1990s. Also, aircraft marshalling signals were standardized, so that any NATO aircraft could land at any NATO base. Other standards such as the NATO phonetic alphabet have made their way beyond NATO into civilian use. During most of the duration of the Cold War, NATO maintained a holding pattern with no actual military engagement as an organization. On July 1, 1968, the Nuclear Non-Proliferation Treaty opened for signature: NATO argued that its nuclear weapons sharing arrangements did not breach the treaty as United States forces controlled the weapons until a decision was made to go to war, at which point the treaty would no longer be controlling. Few states knew of the NATO nuclear sharing arrangements at that time, and they were not challenged. On May 30, 1978, NATO countries officially defined two complementary aims of the Alliance, to maintain security and pursue détente. This was supposed to mean matching defenses at the level rendered necessary by the Warsaw Pact's offensive capabilities without spurring a further arms race. On December 12, 1979, in light of a build-up of Warsaw Pact nuclear capabilities in Europe, ministers approved the deployment of U.S. GLCM cruise missiles and Pershing II theater nuclear weapons in Europe. The new warheads were also meant to strengthen the western negotiating position in regard to nuclear disarmament. This policy was called the Dual Track policy. Similarly, in 1983–1984, responding to the stationing of Warsaw Pact SS-20 medium-range missiles in Europe, NATO deployed modern Pershing II missiles tasked to hit military targets such as tank formations in the event of war. This action led to peace movement protests throughout Western Europe. With the background of the build-up of tension between the Soviet Union and the United States, NATO decided, under the impetus of the Reagan presidency, to deploy Pershing II and cruise missiles in Western Europe, primarily West Germany. These missiles were theater nuclear weapons intended to strike targets on the battlefield if the Soviets invaded West Germany. Yet, support for the deployment was wavering and many doubted whether the push for deployment could be sustained. But on Sept. 1, 1983, the Soviet Union shot down a Korean airliner, loaded with passengers, when it crossed into Soviet airspace–an act which President Reagan characterized as a "massacre." The barbarity of this act, as the United States and the world understood it, galvanized support for the deployment—which stood in place until the later accords between Reagan and Mikhail Gorbachev. The membership of the organization in this time period likewise remained largely static. In 1974, as a consequence of the Turkish invasion of Cyprus, Greece withdrew its forces from NATO's military command structure, but, with Turkish cooperation, were readmitted in 1980. On May 30, 1982, NATO gained a new member when, following a referendum, the newly democratic Spain joined the alliance. 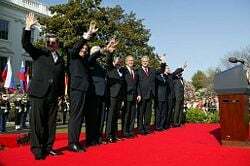 The NATO Secretary General, the U.S. President, and the Prime Ministers of Latvia, Slovenia, Lithuania, Slovakia, Romania, Bulgaria, and Estonia after a ceremony welcoming them into NATO on March 29, 2004 at the Istanbul Summit. The end of the Cold War and the dissolution of the Warsaw Pact in 1991 removed the de facto main adversary of NATO. This caused a strategic re-evaluation of NATO's purpose, nature and tasks. In practice this ended up entailing a gradual (and still ongoing) expansion of NATO to Eastern Europe, as well as the extension of its activities to areas that had not formerly been NATO concerns. 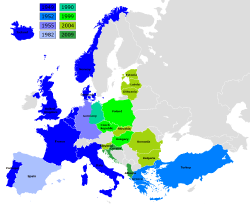 The first post-Cold War expansion of NATO came with the reunification of Germany on October 3, 1990, when the former East Germany became part of the Federal Republic of Germany and the alliance. This had been agreed in the Two Plus Four Treaty earlier in the year. To secure Soviet approval of a united Germany remaining in NATO, it was agreed that foreign troops and nuclear weapons would not be stationed in the east. The scholar Stephen F. Cohen argued in 2005 that a commitment was given that NATO would never expand further east, but according to Robert B. Zoellick, then a State Department official involved in the Two Plus Four negotiating process, this appears to be a misperception; no formal commitment of the sort was made. On May 7, 2008, The Daily Telegraph held an interview with Gorbachev in which he repeated his view that such a commitment had been made. Gorbachev said "the Americans promised that NATO wouldn't move beyond the boundaries of Germany after the Cold War but now half of central and eastern Europe are members, so what happened to their promises? It shows they cannot be trusted." As part of post-Cold War restructuring, NATO's military structure was cut back and reorganized, with new forces such as the Headquarters Allied Command Europe Rapid Reaction Corps established. The Treaty on Conventional Armed Forces in Europe agreed between NATO and the Warsaw Pact and signed in Paris in 1990, mandated specific reductions. The changes brought about by the collapse of the Soviet Union on the military balance in Europe were recognized in the Adapted Conventional Armed Forces in Europe Treaty, signed some years later. The first NATO military operation caused by the conflict in the former Yugoslavia was Operation Sharp Guard, which ran from June 1993–October 1996. It provided maritime enforcement of the arms embargo and economic sanctions against the Federal Republic of Yugoslavia. On February 28, 1994, NATO took its first military action, shooting down four Bosnian Serb aircraft violating a U.N.-mandated no-fly zone over central Bosnia and Herzegovina. Operation Deny Flight, the no-fly-zone enforcement mission, had begun a year before, on April 12, 1993, and was to continue until December 20, 1995. NATO air strikes that year helped bring the war in Bosnia to an end, resulting in the Dayton Agreement, which in turn meant that NATO deployed a peacekeeping force, under Operation Joint Endeavor, first named IFOR and then SFOR, which ran from December 1996 to December 2004. Following the lead of its member nations, NATO began to award a service medal, the NATO Medal, for these operations. A NATO bombing campaign, Operation Deliberate Force, began in August, 1995, against the Army of Republika Srpska, after the Srebrenica massacre. On March 24, 1999, NATO saw its first broad-scale military engagement in the Kosovo War, where it waged an 11-week bombing campaign, which NATO called Operation Allied Force, against what was then the Federal Republic of Yugoslavia, in an effort to stop Serbian-led ethnic cleansing. A formal declaration of war never took place (in common with all wars since World War II). The conflict ended on 11 June 1999, when Yugoslavian leader Slobodan Milosevic agreed to NATO’s demands by accepting UN resolution 1244. NATO then helped establish the KFOR, a NATO-led force under a United Nations mandate that operated the military mission in Kosovo. In August–September 2001, the alliance also mounted Operation Essential Harvest, a mission disarming ethnic Albanian militias in the Republic of Macedonia. The United States, the United Kingdom, and most other NATO countries opposed efforts to require the U.N. Security Council to approve NATO military strikes, such as the ongoing action against Yugoslavia, while France and some others claimed that the alliance needed U.N. approval. The U.S./U.K. side claimed that this would undermine the authority of the alliance, and they noted that Russia and China would have exercised their Security Council vetoes to block the strike on Yugoslavia, and could do the same in future conflicts where NATO intervention was required, thus nullifying the entire potency and purpose of the organization. The September 11 attacks caused NATO to invoke Article 5 of the NATO Charter for the first time in its history. The Article says that an attack on any member shall be considered to be an attack on all. The invocation was confirmed on 4 October 2001 when NATO determined that the attacks were indeed eligible under the terms of the North Atlantic Treaty. The eight official actions taken by NATO in response to the attacks included : Operation Eagle Assist and Operation Active Endeavour. Operation Active Endeavour is a naval operation in the Mediterranean Sea and is designed to prevent the movement of terrorists or weapons of mass destruction as well as to enhance the security of shipping in general. It began on October 4, 2001. Despite this early show of solidarity, NATO faced a crisis little more than a year later, when on February 10, 2003, France and Belgium vetoed the procedure of silent approval concerning the timing of protective measures for Turkey in case of a possible war with Iraq. Germany did not use its right to break the procedure but said it supported the veto. On the issue of Afghanistan on the other hand, the alliance showed greater unity: On April 16, 2003 NATO agreed to take command of the International Security Assistance Force (ISAF) in Afghanistan. The decision came at the request of Germany and the Netherlands, the two nations leading ISAF at the time of the agreement, and all 19 NATO ambassadors approved it unanimously. On August 11, 2003 NATO commenced its first mission ever outside Europe when it assumed control over International Security Assistance Force (ISAF) in Afghanistan. This marked the first time in NATO’s history that it took charge of a mission outside the north Atlantic area. Canada had originally been slated to take over ISAF by itself on that date. However, some critics feel that national caveats or other restrictions undermine the efficiency of ISAF. For instance, political scientist Joseph Nye stated in a 2006 article that "many NATO countries with troops in Afghanistan have 'national caveats' that restrict how their troops may be used. While the Riga summit relaxed some of these caveats to allow assistance to allies in dire circumstances, Britain, Canada, the Netherlands, and the United States are doing most of the fighting in southern Afghanistan, while French, German, and Italian troops are deployed in the quieter north. Due to the intensity of the fighting in the south, France has recently allowed a squadron of Mirage 2000 fighter/attack aircraft to be moved into the area, to Khandahar, in order to reinforce the alliance's efforts. It is difficult to see how NATO can succeed in stabilizing Afghanistan unless it is willing to commit more troops and give commanders more flexibility." If these caveats were to be eliminated, it is argued that this could help NATO to succeed. In January 2004, NATO appointed Minister Hikmet Çetin, of Turkey, as the Senior Civilian Representative (SCR) in Afghanistan. Minister Cetin is primarily responsible for advancing the political-military aspects of the Alliance in Afghanistan. In August 2004, following United States pressure, NATO formed the NATO Training Mission - Iraq, a training mission to assist the Iraqi security forces in conjunction with the U.S. led MNF-I. On July 31, 2006, a NATO-led force, made up mostly of troops from Canada, Great Britain, Turkey and the Netherlands, took over military operations in the south of Afghanistan from a United States-led anti-terrorism coalition. 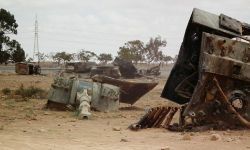 During the 2011 Libyan civil war, violence between protestors and the Libyan government under Colonel Muammar Gaddafi escalated, and on 17 March 2011 led to the passage of United Nations Security Council Resolution 1973, which called for a ceasefire, and authorized military action to protect civilians. A coalition that included several NATO members began enforcing a no-fly zone over Libya shortly afterwards. On 20 March 2011, NATO states agreed on enforcing an arms embargo against Libya with Operation Unified Protector using ships from NATO Standing Maritime Group 1 and Standing Mine Countermeasures Group 1, and additional ships and submarines from NATO members. They would "monitor, report and, if needed, interdict vessels suspected of carrying illegal arms or mercenaries". On 24 March, NATO agreed to take control of the no-fly zone from the initial coalition, while command of targeting ground units remained with the coalition's forces. Current membership of NATO in Europe. New NATO structures were also formed while old ones were abolished: The NATO Response Force (NRF) was launched at the 2002 Prague Summit on November 21. On June 19, 2003, a major restructuring of the NATO military commands began as the Headquarters of the Supreme Allied Commander, Atlantic were abolished and a new command, Allied Command Transformation (ACT), was established in Norfolk, Virginia, USA, and the Supreme Headquarters Allied Powers Europe (SHAPE) became the Headquarters of Allied Command Operations (ACO). ACT is responsible for driving transformation (future capabilities) in NATO, while ACO is responsible for current operations. Membership went on expanding with the accession of seven more Northern European and Eastern European countries to NATO: Estonia, Latvia and Lithuania and also Slovenia, Slovakia, Bulgaria, and Romania. They were first invited to start talks of membership during the 2002 Prague Summit, and joined NATO on March 29, 2004, shortly before the 2004 Istanbul Summit. The same month, NATO's Baltic Air Policing began, which supported the sovereignty of Latvia, Lithuania and Estonia by providing fighters to react to any unwanted aerial intrusions. Four fighters are based in Lithuania, provided in rotation by virtually all the NATO states. The 2006 NATO summit was held in Riga, Latvia, which had joined the Atlantic Alliance two years earlier. It is the first NATO summit to be held in a country that was part of the Soviet Union, and the second one in a former COMECON country (after the 2002 Prague Summit). Energy Security was one of the main themes of the Riga Summit. 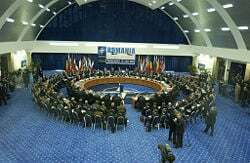 At the April 2008 summit in Bucharest, Romania, NATO agreed to the accession of Croatia and Albania and invited them to join; they both joined in April, 2009. Future expansion is a topic of debate in many countries. Cyprus and Macedonia are stalled from accession by, respectively, Turkey and Greece, pending the resolution of disputes between them. Other countries which have a stated goal of eventually joining include Bosnia and Herzegovina, Montenegro, Georgia. The incorporation of former Warsaw Pact countries has been a cause of increased tension between NATO countries and Russia. NATO remains the key security structure in Europe. As such it has expansion plans to extend its security reach. Potential future members include the Republic of Macedonia/former Yugoslav Republic of Macedonia, which was under consideration to enter NATO earlier but ran into difficulties over its name. In 2018, NATO invited Macedonia to begin membership talks, saying the country could join the organization once the naming issue was resolved. Other potential candidate countries include, in South-eastern Europe, Bosnia and Herzegovina, Georgia, and Ukraine. Russia continues to oppose further expansion, seeing it as inconsistent with understandings between Soviet leader Mikhail Gorbachev and United States President George H. W. Bush which allowed for a peaceful unification of Germany. NATO's expansion policy is seen by Russia as a continuation of a Cold War attempt to surround and isolate Russia. NATO began in an attempt to thwart feared Communist expansionism, and despite the collapse of communism in Eastern Europe, the relationship between Russia and NATO still remains problematic. There are currently 29 members within NATO. Denmark Unlike Denmark's EU membership, its NATO membership does include the Faroe Islands and Greenland. France France withdrew from the integrated military command in 1966 to pursue an independent defense system but returned to full membership on April 4, 2009. Iceland Iceland, the sole member that does not have its own standing army, joined on the condition that it would not be expected to establish one. However, its strategic geographic position in the Atlantic made it an invaluable member. It has a Coast Guard and has recently contributed a voluntary peacekeeping force, trained in Norway for NATO. 18 February 1952 Greece First Greece withdrew its forces from NATO’s military command structure from 1974 to 1980 as a result of Greco-Turkish tensions following the 1974 Turkish invasion of Cyprus. 9 May 1955 Germany Second Joined as West Germany; Saarland reunited with it in 1957 and the territories of Berlin and the former German Democratic Republic reunited with it on 3 October 1990. The GDR (East Germany) was a member of the rival Warsaw Pact 1956–1990. 12 March 1999 Czech Republic Fourth Member of the rival Warsaw Pact 1955–1991 as part of Czechoslovakia. Hungary Member of the rival Warsaw Pact 1955–1991. Poland Member of the rival Warsaw Pact 1955–1991. 29 March 2004 Bulgaria Fifth Member of the rival Warsaw Pact 1955–1991. Estonia Member of the rival Warsaw Pact 1955–1991 as part of the Soviet Union. Latvia Member of the rival Warsaw Pact 1955–1991 as part of the Soviet Union. Lithuania Member of the rival Warsaw Pact 1955–1991 as part of the Soviet Union. Romania Member of the rival Warsaw Pact 1955–1991. Slovakia Member of the rival Warsaw Pact 1955–1991 as part of Czechoslovakia. 1 April 2009 Albania Sixth Member of the rival Warsaw Pact 1955–1968. Political dialogue with Japan began in 1990, and since then, the Alliance has gradually increased its contact with countries that do not form part of any of these cooperation initiatives. In 1998, NATO established a set of general guidelines that do not allow for a formal institutionalization of relations, but reflect the Allies' desire to increase cooperation. Following extensive debate, the term "Contact Countries" was agreed by the Allies in 2000. By 2012, the Alliance had broadened this group, which meets to discuss issues such as counter-piracy and technology exchange, under the names "partners across the globe" or "global partners." Australia and New Zealand, both contact countries, are also members of the AUSCANNZUKUS strategic alliance, and similar regional or bilateral agreements between contact countries and NATO members also aid cooperation. Colombia is the NATO’s latest partner and Colombia has access to the full range of cooperative activities NATO offers to partners; Colombia became the first Latin American country to cooperate with NATO. The internal NATO organization includes political structures, military structures, and agencies and organizations immediately subordinate to NATO headquarters. The main headquarters of NATO is located on Boulevard Léopold III, B-1110 BRUSSELS, which is in Haren, part of the City of Brussels. 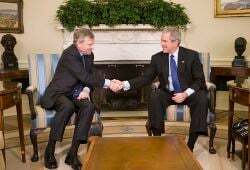 Secretary General Jaap de Hoop Scheffer meeting George W. Bush on White House news release March 20, 2006. Like any alliance, NATO is ultimately governed by its member states. The North Atlantic Treaty (also known as the Washington Treaty) and other agreements outline how decisions are to be made within NATO. Each of the members sends a delegation or mission to NATO’s headquarters in Brussels, Belgium. The senior permanent member of each delegation is known as the Permanent Representative and is generally a senior civil servant or an experienced ambassador (and holding that diplomatic rank). Together the Permanent Members form the North Atlantic Council (NAC), a body which meets together at least once a week and has effective political authority and powers of decision in NATO. 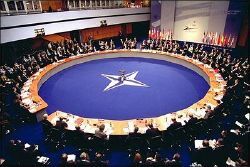 From time to time the Council also meets at higher levels involving Foreign Ministers, Defense Ministers or Heads of State or Government (HOSG); it is at these meetings that major decisions regarding NATO’s policies are generally taken. However, it is worth noting that the Council has the same authority and powers of decision-making, and its decisions have the same status and validity, at whatever level it meets. NATO summits also form a further venue for decisions on complex issues, such as enlargement. The second pivotal member of each country's delegation is the Military Representative, a senior officer from each country's armed forces. Together the Military Representatives form the Military Committee (MC), a body responsible for recommending to NATO’s political authorities those measures considered necessary for the common defense of the NATO area. Its principal role is to provide direction and advice on military policy and strategy. It provides guidance on military matters to the NATO Strategic Commanders, whose representatives attend its meetings, and is responsible for the overall conduct of the military affairs of the Alliance under the authority of the Council. Like the council, from time to time the Military Committee also meets at a higher level, namely at the level of Chiefs of defense, the most senior military officer in each nation's armed forces. The Defense Planning Committee excludes France, due to that country's 1966 decision to remove itself from NATO's integrated military structure. On a practical level, this means that issues that are acceptable to most NATO members but unacceptable to France may be directed to the Defense Planning Committee for more expedient resolution. The NATO Parliamentary Assembly, founded in 1955, serves as the consultative interparliamentary organization for the North Atlantic Alliance. Bringing together legislators from all the member states of the Atlantic Alliance, the NATO PA provides a link between NATO and the parliaments of its member nations. At the same time, it facilitates parliamentary awareness and understanding of key security issues and contributes to a greater transparency of NATO policies. Crucially, it helps maintain and strengthen the transatlantic relationship, which underpins the Atlantic Alliance. Subordinate to the political structure are the International Staff and International Military Staff, which administer NATO programmes and carry out high-level political, military, and also civil emergency planning. Over the years, non-governmental citizens' groups have grown up in support of NATO, broadly under the banner of the Atlantic Council/Atlantic Treaty Association movement. NATO E-3A flying with US F-16s in a NATO exercise. NATO's military operations are directed by the Chairman of the NATO Military Committee, and split into two Strategic Commands both commanded by a senior US officer assisted by a staff drawn from across NATO. The Strategic Commanders are responsible to the Military Committee for the overall direction and conduct of all Alliance military matters within their areas of command. Before 2003 the Strategic Commanders were the Supreme Allied Commander Europe (SACEUR) and the Supreme Allied Commander Atlantic (SACLANT) but the current arrangement is to separate command responsibility between Allied Command Transformation (ACT), responsible for transformation and training of NATO forces, and Allied Command Operations, responsible for NATO operations worldwide. The commander of Allied Command Operations retained the title "Supreme Allied Commander Europe (SACEUR)," and is based in the Supreme Headquarters Allied Powers Europe (SHAPE) located at Casteau, north of the Belgian city of Mons. This is about 80 km (50 miles) south of NATO’s political headquarters in Brussels. ACO is headed by SACEUR, a US four star general with the dual-hatted role of heading US European Command, which is headquartered in Stuttgart, Germany. SHAPE was in Paris until 1966, when French president Charles de Gaulle withdrew French forces from the Atlantic Alliance. NATO's headquarters were then forced to move to Belgium, while many military units had to move. ACO includes Joint Force Command Brunssum in the Netherlands, Joint Force Command Naples in Italy, and Joint Command Lisbon, all multinational headquarters with many nations represented. JFC Brunssum has its land component, Allied Land Component Command Headquarters Heidelberg at Heidelberg, Germany, its air component at Ramstein in Germany, and its naval component at the Northwood Headquarters in the northwest suburbs of London. JFC Naples has its land component in Madrid, air component at Izmir, Turkey, and naval component in Naples, Italy. It also directs KFOR in Kosovo. JC Lisbon is a smaller HQ with no subordinate commands. Lajes Field, in the Portuguese Azores, is an important transatlantic staging post. 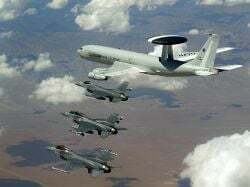 Directly responsible to SACEUR is the NATO Airborne Early Warning Force at NATO Air Base Geilenkirchen in Germany where a jointly funded fleet of E-3 Sentry AWACS airborne radar aircraft is located. The C-17s of the NATO Strategic Airlift Capability, to be made operational in the next few years, will be based at Pápa airfield in Hungary, and probably come under SACEUR's control. Allied Command Transformation (ACT) is based in the former Allied Command Atlantic headquarters in Norfolk, Virginia, USA. Allied Command Atlantic, usually known as SACLANT (Supreme Allied Commander Atlantic), after its commander, became ACT in 2003. It is headed by the Supreme Allied Commander Transformation (SACT), a US four-star general or admiral with the dual-hatted role as commander US Joint Forces Command (COMUSJFCOM). There is also an ACT command element located at SHAPE in Mons, Belgium. Subordinate ACT organizations include the Joint Warfare Center (JWC) located in Stavanger, Norway (in the same site as the Norwegian NJHQ); the Joint Force Training Center (JFTC) in Bydgoszcz, Poland; the Joint Analysis and Lessons Learned Center (JALLC) in Monsanto, Portugal; and the Centre for Maritime Research and Experimentation (CMRE), La Spezia, Italy. NATO Communications and Information Systems Agency (NCSA), based in Mons (BEL), was established in August 2004 from the former NATO Communications and Information Systems Operating and Support Agency (NACOSA). NATO has a number of Centres of Excellence (COEs), essentially multinational research, development, and evaluation bodies. The Organization says they "provide recognized subject matter expertise in support of transformation and interoperability, especially in the fields of doctrine and concept development and validation, training, education and exercises, as well as analysis and lessons learned." They are funded nationally or multi-nationally and have individual relationships with NATO formalized through memoranda of understanding. ↑ "English and French shall be the official languages for the entire North Atlantic Treaty Organization.," NATO, Final Communiqué following the meeting of the North Atlantic Council on September 17, 1949. Retrieved July 28, 2018. ↑ David Reynolds, The Origins of the Cold War in Europe: International Perspectives (New Haven, CT: Yale University Press, 1994, ISBN 978-0300105629), 13. ↑ 3.0 3.1 3.2 David C. Isby and Charles Kamps Jr., Armies of NATO's Central Front (Jane's Publishing Company Ltd, 1985, ISBN 978-0710603418). ↑ Robert E. Osgood, NATO: The Entangling Alliance (Westport, CT: Praeger, 1999, ISBN 978-0275964191), 76. ↑ NATO: The Man with the Oilcan TIME magazine (March 24, 1952). Retrieved July 28, 2018. ↑ Geoffrey Roberts, Molotov's Proposal that the USSR Join NATO, March 1954 Wilson Center, November 21, 2011. Retrieved July 28, 2018. ↑ Christopher Cox, Address to the American Academy in Berlin and the American Chamber of Commerce in Germany U.S. Securities and Exchange Commission, April 26, 2007. Retrieved July 28, 2018. ↑ Stephen F. Cohen, Gorbachev's Lost Legacy The Nation, March 14, 2005. Retrieved July 29, 2018. ↑ Robert B. Zoellick, The Lessons of German Unification, American Institute for Contemporary German Studies, September 30, 2015. Retrieved July 29, 2018. ↑ Adrian Blomfield and Mike Smith, Gorbachev: US could start new Cold War The Daily Telegraph, May 6, 2008. Retrieved July 29, 2018. ↑ NATO Update: Invocation of Article 5 confirmed - 2 October 2001. Retrieved July 29, 2018. ↑ La France et l'OTAN Le Monde, August 30, 2007. Retrieved July 29, 2018. ↑ Joseph S. Nye, NATO after Riga Project Syndicate, December 7, 2006. Retrieved July 29, 2018. ↑ 14.0 14.1 Statement by the NATO Secretary General on Libya arms embargo NATO, March 22, 2011. Retrieved July 30, 2018. ↑ Press briefing by NATO Spokesperson Oana Lungescu, Brigadier General Pierre St-Amand, Canadian Air Force and General Massimo Panizzi, spokesperson of the Chairman of the Military Committee NATO, March 23, 2011. Retrieved July 30, 2018. ↑ NATO to police Libya no-fly zone Al Jazeera, March 25, 2011. Retrieved July 30, 2018. ↑ Mahdi Darius Nazemroaya, The Globalization of Military Power: NATO Expansion Global Research, May 18, 2007. Retrieved July 30, 20182. ↑ James Platt, Condoleezza Rice wants Russia to acknowledge USA's interests on post-Soviet space Pravda, May 4, 2006. Retrieved July 30, 2018. ↑ The Partnership for Peace NATO, June 7, 2017. Retrieved July 30, 2018. ↑ 21.0 21.1 NATO Partner countries NATO, November 11, 2015. Retrieved July 30, 2018. ↑ NATO’s relations with Contact Countries NATO, April 9, 2009. Retrieved July 30, 2018. ↑ NATO PARTNERSHIPS: DOD Needs to Assess U.S. Assistance in Response to Changes to the Partnership for Peace Program United States Government Accountability Office, September 2010. Retrieved July 30, 2018. ↑ Relations with Colombia NATO, May 31, 2018. Retrieved July 30, 2018. ↑ NATO homepage Retrieved July 30, 2018. ↑ Founding Treaty NATO. Retrieved July 30, 2018. ↑ National delegations to NATO NATO, March 14, 2016. Retrieved July 30, 2018. ↑ Eide Espen Barth and Frédéric Bozo, Should NATO play a more political role? Nato Review, Spring 2005. Retrieved July 30, 2018. ↑ 29.0 29.1 NATO, NATO Handbook. Retrieved July 30, 2018. ↑ Centre for Maritime Research and Experimentation Retrieved July 30, 2018. ↑ NATO, Organizations and Agencies, NATO. Retrieved July 30, 2018. ↑ NATO Communications and Information Agency (NCI Agency) Retrieved July 30, 2018. ↑ NATO Science and Technology Organization. Retrieved July 30, 2018. ↑ NATO opens new centre of excellence on cyber defence - Contributing to transformation, NATO. Retrieved July 30, 2018. NATO searches for defining role BBC, February 3, 2005. Will Turkey be complicit in another war against another neighbour? CASMII, February 24, 2008. This page was last modified on 2 November 2018, at 19:55.